Founded in 1881, Flagstaff Arizona is a historic city located at an elevation of 7,000 feet. The city lies just south of the San Francisco Peaks which include Mt. Humphreys, Arizona’s highest peak, which we hiked in 2006. Travelers passing through Flagstaff, can use either Interstate 40, or old Route 66 for a more vintage experience. Interstate 40 is a major trucking route, while the BNSF Railroad is a major freight transportation system that passes through Flagstaff. 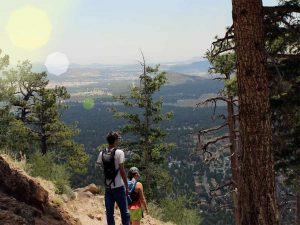 You will find numerous outdoor activities during all seasons of the year because of Flagstaff’s comfortable summer temperatures and extreme winter weather. 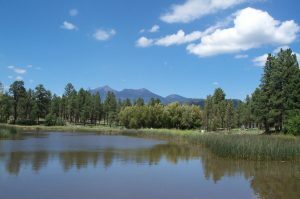 For instance, golfing, hiking, mountain biking, horseback riding, kayaking, snow skiing, snowshoeing and ice skating which are all popular in Flagstaff. 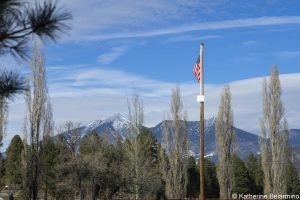 A scouting party from Boston in 1876 gave Flagstaff Arizona its name when they put up a pole with the American Flag to celebrate the country’s centennial. You can see the actual “flag staff”, flag pole today at Flagstaff Park on Thorpe Road just north of downtown between Bonita St/Hopi Dr and Aztec St, near the Thorpe Park Soccer Fields. Flagstaff’s unique geographical location will intrigue you. 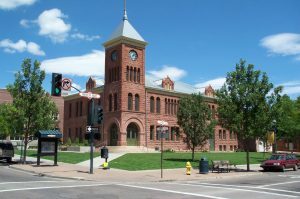 Located on the southwestern edge of the Colorado Plateau, the city is situated among the largest contiguous Ponderosa Pine Tree forest in the world. The mountain you see nearest Flagstaff is Mt. Elden where you’ll find great hiking trails. Geology plays a large part in Flagstaff. 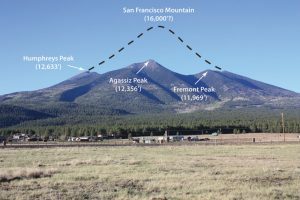 The San Francisco Peaks were formed from a giant, single-cone volcano which exploded thousands of years ago. The mountain was once a single-cone peak and blew out the eastern side, much as Mt. St. Helens did in 1980. Mt. 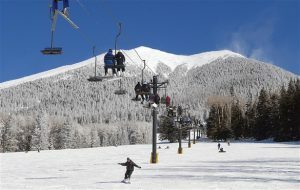 Humphreys is the tallest of all the peaks, as well as the tallest in Arizona at 12,633 feet (3,851 m). You can take a 4.5 mile hike to the top for fabulous views which extend to the Grand Canyon. Be sure you take plenty of water. If you are an astronomy enthusiast, Flagstaff is a great place to stargaze. Lowell Observatory is a must-see place for you to visit. This is where the (dwarf) planet Pluto was discovered. Flagstaff’s high elevation, clean air, and dark skies attract astronomers from all over the world. Downtown Flagstaff lies in a small valley between Mars Hill to the east, and Cherry Hill to the west. Mars Hill where the Lowell Observatory is located. Northern Arizona University is located south of the downtown area within walking or biking distance. 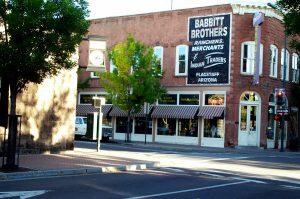 Historic Route 66 passes through downtown Flagstaff and access to Interstate 40 is a short two miles south. The charm of the downtown area is attractive to tourists and locals alike. Many of the buildings are historic, dating back the the 1800’s. This is a popular place for trendy coffee bars, martini bars, restaurants, and art galleries. Heritage Square is an open plaza where many activities are held. Such activities are outdoor evening movies and concerts in the summer, and the holiday Christmas tree lighting ceremony in the winter. A variety of festivals and parades occur throughout the year as well. For example, on New Year’s Eve, people gather around the Weatherford Hotel as a 70-pound, 6-foot (1.8 m) tall, metallic pine cone is dropped from the roof at midnight. The annual Independence Day parade and Christmas parade are the two most popular parades, occurring at two very different seasons of the year. Wheeler Park located near City Hall hosts festivals such as Hullabaloo, Pride-in-the-Pines, Art in the Park, Oktoberfest, and more. See current event calendar information here. Flagstaff has become known for an attraction to outdoor enthusiasts because of its terrain, high elevation, and seasonal sports. The summer season attracts campers, hikers, climbers, runners, and mountain bikers. Likewise, the cold and snowy winters attract those who love winter sports such as snow skiing, snow-boarding, cross-country skiing, and snow-shoeing. Additionally, because of Flagstaff’s high elevation at 7,000 feet, many teams from around the world also come here to practice their sports for extreme endurance. There are 679 acres of city parks with Buffalo Park being the largest and has the easiest access to forest hiking trails. 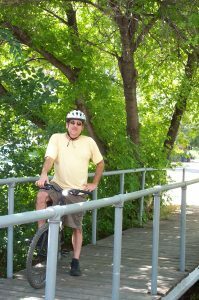 The Flagstaff Urban Trail System (FUTS) is an extensive network of walking and biking trails in and around the city that link up and give access to almost any place in the city. Disc golf is popular here and Flagstaff has a total of five courses to play in. Four major country club golf courses provide great summertime golfing and relief from the heat of the lower elevations in Arizona. 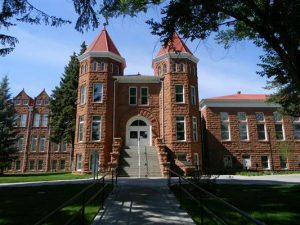 Northern Arizona University (NAU) was founded in 1899 with only 23 students and one professor. As of the Fall of 2017, the student enrollment at NAU Flagstaff campus was 22,740. 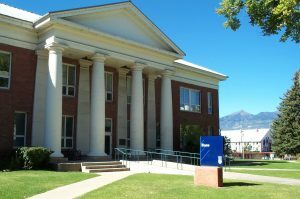 NAU is Flagstaff’s largest employer with a total staff of 4,863 (as of 2017). See NAU statistics here. The campus grew from just a handful of buildings in the early 1900’s to a diverse variety of streets, classroom buildings, dorms, and facilities today. The campus’ iconic Old Main building was the original building housing a few dorm rooms and classrooms. 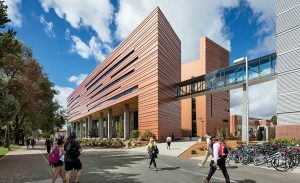 NAU is proud of its nationally ranked programs, its high-research status, and its emergence as a leader in sustainability, science, business, green building, and cultural arts. There are five distinct seasons in Flagstaff Arizona. 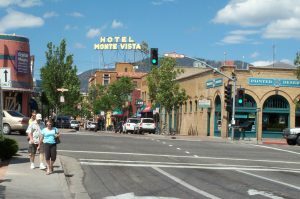 Summer is popular in Flagstaff due to the moderate temperatures. Also, it is the “Monsoon Season” when thunderstorms may occur mid-day. Fall is beautiful with its cooler temperatures and colorful changing foliage from September to early November. Winters are cold and snowy with periods of sunny days between storms. 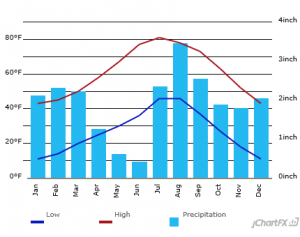 Spring is generally dry and windy however there may be occasional snow showers. 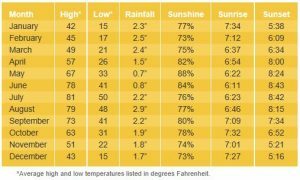 From May to early July is Flagstaff’s dry and warm (almost hot) season.